"A warrior who defends the world of the Sea of Darkness. He prides himself on his fighting prowess both on the ground and, of course, in the water.".. 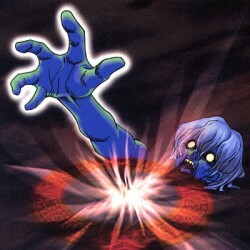 When this card is sent to the Graveyard as a result of battle, you may select 1 Water monster with an ATK of 1500 or less from your Deck and Special Summon it to the Field (no Tribute is required for ..
"This card can only be Special Summoned by removing 2 WATER monster in your Graveyard from play. When this card destroys an opponent's monster and sends it to the Graveyard as a result of battle, your..
"As long as "Umi" remains face-up on the field, this card can attack your opponent's Life Points directly.".. "Send "Umi" on your side of the field to the Graveyard to destroy all cards on the field except this card. "..